AVM Rescue Farmhouse Cowis another point & click escape game developed by AVMGames. 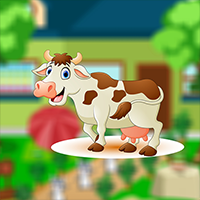 In this escape game, assume that you have been stuck inside a farm land. It seems like no one was on that farm house, just a beautiful Cow. The Cow seems really hungry but locked in that farm farmhouse. You need to help the cow. But it takes hard work on your part to find the key. Are you ready for the challenge? Find clues and solve puzzles to escape. Good Luck and have fun! Green-handled tool used on couch in s3, no hotspot.